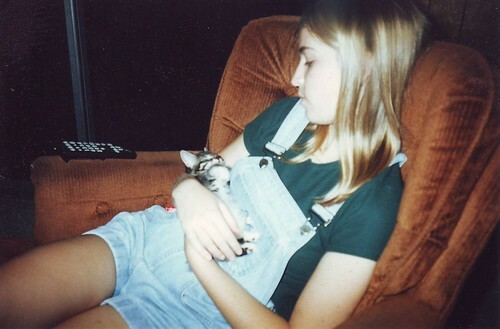 This photo was taken a little more than fifteen years ago. It was 1996 and I was about to start my senior year of high school. In June my family had adopted two adorable kittens, Bob and Tom, and we spent that entire summer watching them do cute things. We were so in love with them that at first we didn’t even notice their abnormal tails! (Fairly common birth defects, according to the vet.) The fact that they were the last two in their litter to be adopted should have tipped us off, but nothing could convince us they weren’t perfect. The dynamic duo was part of our family for more than eleven years until we lost Tom to kidney failure in January 2008. Bob has been an only cat (and loving it) since then, but the way it looks right now he won’t be with us much longer. He got very sick on Monday and had surgery last night to remove a potential abdominal blockage, but the vet couldn’t find anything. The prognosis is not good. It’s been more than fifteen years since that roly-poly black and white cat came into our lives and it’s sad to imagine a world without him. Even though I haven’t lived at home much since I was eighteen, Bob still talked to me on the phone just about every time I called my parents. Hearing him meow or purr always made me smile. We all love you, Bob, and we want the best for you. I’m praying that you pull through this. Note: I’m not all that happy with this post, but I have a lot on my mind tonight. My grandfather, my grandmother, and my cat Bob are all in the hospital (not the same hospital, of course) and I’m worried about all of them. Hopefully tomorrow will bring some good news about all three. I’m having trouble being optimistic, but I’m trying. My pedometer and I have had a falling out. We used to be inseparable. Not too long ago I was eager to put it on every morning and I’d obsessively check my step count throughout the day, but since then our love affair has waned. Boeing on the Move, which I credit with getting me up off the couch for the first time in over a year, ended in July, but I had every intention of keeping up with my walking regimen after that. It didn’t work out quite the way I planned. Not wearing my pedometer was definitely a nice change, but it was so easy to slip back into my old (bad) habits without it to remind me that I should walk to the grocery store instead of drive. Luckily Boeing on the Move was reincarnated in a slightly different form, called the Million Step Challenge, on August 18th. This time around we have until mid-December to accumulated one million steps. No daily goal – the final total is all that matters. Theoretically it shouldn’t be that difficult because one million steps in that time frame works out to just be a little more than 7000 steps per day, but I’m having trouble with motivation. I did drag myself to the gym on Sunday, even thought my legs were really sore from my half-marathon walk the day before, and I made it through a pretty intense cardio workout. 50 minutes on the elliptical and 40 minutes on the stationary bike – not too shabby. Unfortunately the outside of my right foot was bothering me afterwards. It only hurts after I walk or stand for a while so I hope it’s just a pulled muscle and not a more serious injury. I went to spinning class last night, which wasn’t too bad, and today was a rest day. If my foot’s not feeling significantly better in a couple of days I’ll have to go get an x-ray to make sure I don’t have a stress fracture or something worse. That would be very disappointing with only a little more than a month until the Long Beach half marathon. I need all the training I can get before then! But I digress. The bottom line is that I’m trying to patch things up with my pedometer so that we can be friends again. I’m afraid we’ll never rekindle out former love, but I’ll be happy with a comfortable, sustainable camaraderie. So I’m getting back in the habit of wearing my pedometer everyday, even when my daily step count is minuscule, and I’m trying to get back to walking everywhere that I can again. I know that establishing a lasting lifestyle change takes time. Life is a marathon, not a sprint. I also know that if I stay healthy I’ll have the best chance at long-term happiness. And that’s a goal worth striving for. As I was leaving the gym this evening I had every intention of writing something profound and interesting for my webpage when I got home, but it just didn’t work out. I was way too busy doing laundry, washing dishes, and making dinner to do any writing. This makes me sad, but I should know better. I should have remembered that I have the least amount of free time on Mondays because I get home so late from spinning. Somehow it always frustrates me, though. I even started composing a post at the gym today, but by the time I sat down to start elaborating on the topic it was already too late to finish it tonight. You see, I’m not the fastest writer and I am easily distracted. Oh well. This short paragraph will have to do for today. We’ll see if I can do any better on that profound and interesting post for tomorrow. No promises. 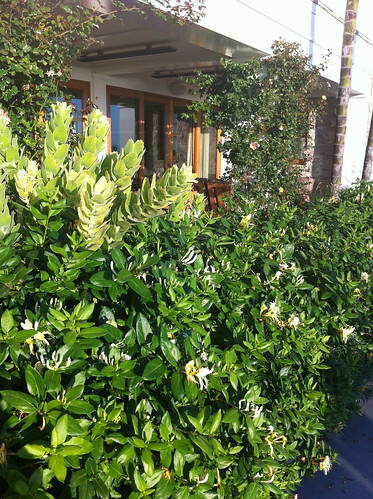 I took this picture of a honeysuckle vine in Manhattan Beach during my half-marathon walk yesterday. I love walking past the house that’s graced with this vine because as far as I’m concerned, honeysuckle flowers produce the best smell in the whole world. It reminds me of Tallahassee, which might explain my bias. Considering how much time I spent outside, I figured this photo of the honeysuckles was the best illustration of this weekend – especially when I couldn’t think of anything else to write about today. Time to get ready for another week of work! ***I had to be at work by 3 AM on Thursday and Friday which made the last half of my week very boring. My routine was get up in the wee hours of the morning, work until about noon, go home and go to bed by 8 PM. Nothing exciting about it. I did go to spinning class on Wednesday morning, but that was my only exercise for the week due to my wildly fluctuating schedule. My steps counts barely registered on my pedometer for Thursday and Friday because I was too wiped out to do anything but watch TV when I got home from work. ***Going to bed early at night combined with Dan’s on-going marathon training meant that we didn’t get to see each other very much at all during the week. I kissed him goodbye each morning (around 2 AM), but that was pretty much it. So I was thrilled when I got an email from Dan at work yesterday saying that he’d made us a dinner reservation at Bouchon Bistro in Beverly Hills! We had a fantastic dinner there and spent some much-needed quality time together. ***When Dan and I got home from dinner last night we crashed on the couch to digest and watched the first episode of the new season of “Top Chef: Just Desserts.” Not only are we fans of Top Chef in general, but we’re of the opinion that the dessert-oriented version of the show is even more fun than the original. Watching talented pastry chefs make scrumptious-looking desserts is an unparalleled delight. It does make you hungry, though. ***Today was the last Tri-Nations rugby match up of the season with Australia and New Zealand duking it out to see who would walk away with the championship trophy. Unfortunately it wasn’t the All Blacks. They fought valiantly, but the Wallabies were just too much for them on their home turf. If you’re a New Zealand fan it was a disappointing end to the Tri-Nations, but the Rugby World Cup will be starting soon! And from New Zealand, no less! Pretty soon Dan and I going to have more games to watch than we have time for. ***It was surprisingly hot in Los Angeles today. A couple of weeks ago I swore it was starting to feel like fall, but since then summer has returned with a vengeance. It didn’t quite hit 90 F in the beach cities today, but it was close. I know to all you folks in Florida 88 F barely even registers as heat, but it’s pretty uncomfortable when you don’t have air conditioning in your house. ***Dan and I planned to do another practice half-marathon today (him running, me walking), but we had to wait until later in the day when the temperature started to drop. I didn’t want another wave of heat exhaustion like last week. So I left the house at 5 PM to start my almost four-hour walk and Dan followed at 7 PM on his run. This turned out to be perfect timing it just kept getting cooler and cooler as the evening progressed. I finished my 13.3 mile walk in 3 hours and 48 minutes, which means I maintained a respectable 3.5 mph pace the entire time. And I still felt good when I got home. Exercising outside at night is definitely the way to go! ***I beat Dan home from our dual exercise session, but luckily just by about ten minutes because he had forgotten to leave me a key so I could get back into the house! Fortunately I wasn’t sitting on the porch for too long before he arrived. Being able to use WiFi from the porch was nice, at least. My weekend workouts aren’t over yet, though. I know my legs are going to be sore in the morning, but I have to drag myself to the gym whether they like it or not. The bikinis I have to wear in Hawaii in just a couple of months are my inspiration! After seeing several recipes for cookies and cream brownies recently on food blogs I was dying to try one of them. 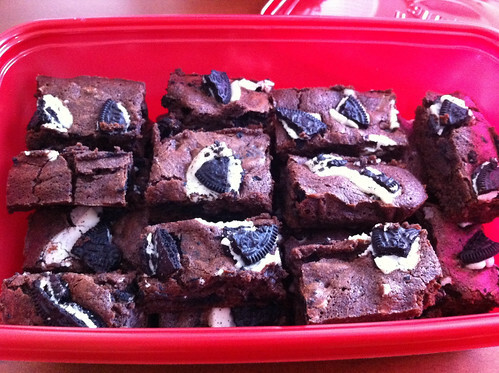 And what better treat to make for my Oreo-fiend co-workers? We go through a lot of the classic sandwich cookies when we’re on business trips in DC. I seriously think half of our caloric intake when we’re on travel is from Oreos. I’m sorry to say that I only got to try one small brownie from this batch of cookies and cream treats I made, but I was suffering from a back spasm the day I took them to work and I left shortly after to Urgent Care. I heard good things about them when I got back to work two days later, though. From the one I ate, I can’t say this was my favorite brownie recipe. I have a feeling simply adding crumbled Oreos my favorite brownie recipe (my twenty-ninth new recipe here) would be absolutely delicious, though. I’ll have to try this out sometime! In a large bowl microwave chocolate and butter until butter is melted and chocolate is partially melted. Whisk until chocolate is completely melted. Let cool for several minutes. Stir in sugar. Add eggs, vanilla, and salt and stir until combined. Add the flour and stir until just combined. Fold in crushed Oreo cookies. Pour the batter into a greased 9×9″ pan (I used an 11×7″ pan because that’s all I had). If you want, crumble a few more Oreos and press the pieces lightly into the top of the batter. Bake at 350 deg F for 28-32 minutes until a toothpick inserted near the center comes out clean, but do not over bake. Cool completely on a wire rack before cutting and serving. Enjoy! Based mostly on The Girl Who Ate Everything’s Cookies and Cream Brownies, but also a little bit by Baking Bites’s Cookies n’ Cream Brownies. Yesterday I wrote about my recent trip to Ikea that was like a blast from the past. One item that really stirred up memories was a little desktop clip lamp that took me back to 1997. When I moved away from home to go to college I was very unprepared to live on my own. Pretty much the only new thing I took with me to UF was a honking huge desktop computer that was so heavy that I could barely carry it 50 feet by myself. Other than that and a set of extra-long sheets that only fit beds in state school dorm rooms, everything else was old. My quilt even belonged to my great-grandmother! One of these old items meant a lot to me, though. Before I left Tallahassee my dear friend Käthe gave me a black desktop clip lamp that I ended up using throughout my entire college career. 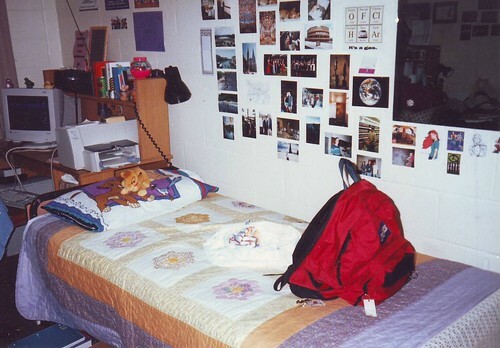 You can see it clipped to the top of my desk, hanging over my bed (with the stuffed Simba and Lion King pillowcase) in the above photo of my freshman-year dorm room. I hated that room, but I loved that lamp. It was especially useful for reading in bed after my roommate went to sleep, which I did a lot. I think I even brought that lamp with me across the country for at least one of my internships. You had to be careful not to burn yourself when turning it off, but next to my computer it was quite possibly the most useful item in any of my college residences. So when I saw the new and improved version of a desktop clip lamp at Ikea last Sunday I immediately thought of Käthe. Her unselfish gift really meant a lot to me, especially when I was living away from home for the first time. I remembered her every time I used it. Thanks Ikea for that great memory! Last weekend we got the new 2012 Ikea catalog in the mail and I spent about an hour poring over the pages, seeing if there was anything I just couldn’t live without. I saw a few things I liked so the next day I drove down the store in Carson (by far the closest) to look around. This brought back a lot of memories. I had never heard of Ikea until I moved to Los Angeles, but over the last nine years I’ve become a big fan of the Swedish furniture store. I’ve used it to furnish two apartments on a very low budget (being a college student doesn’t pay well) and quite a few of those items made the move into our current house. In fact, our guest bedroom is furnished entirely with my past Ikea purchases. While they aren’t as high quality as some of the Ethan Allen and Pottery Barn furniture we own, I still love my old bedroom set as much as when it bought it. Back when I was furnishing my Westwood apartment and then my Seal Beach apartment I spent a lot of time at the Ikea Carson store, wandering around, trying to decide what I wanted. I explored (and was jealous of) all of the model room setups on the third floor, searched for the perfect lamps in the second floor marketplace, and loaded up a cart with flat-packed furniture boxes on the ground floor. And then once the boxes were delivered to my current residence, I spent even more time putting everything together. I can’t say I did the best job assembling some of the larger items (i.e., my dresser and tall bookshelf), but I got a certain amount of satisfaction out of doing it myself. So when I walked into the Ikea Carson store last Sunday it was a little like going back in time. Suddenly I was twenty-five again with a vision of how I wanted my apartment to look and only a vague idea of how to turn it into a reality. I spent about an hour wandering around like I used to back then, but this time I left without buying anything. While I make more money now, I also have many, many more expenses. The one thing I really wanted, a cupcake stand, was nowhere to be found in that huge warehouse so I walked out empty handed. Maybe I’ll go back and look for it some other time, but that trip reminded me what I don’t like about Ikea. It’s always insanely busy! I got there when the doors opened for the day and an hour later when I left the parking lot was full and there were people everywhere. Evidently I’m not the only one in Los Angeles who likes Ikea! 1) Empty freeways at 2 AM. When you have to be at work that early in the morning, one of the perks is not having too many other cars to dodge on your commute. I got to work in about fifteen minutes, which is unheard of any other time of the day. 2) Caffeine. I wasn’t feeling very awake when I got to work, so as soon as I walked in the door I grabbed a can Diet Mt. Dew that I left in the fridge last week. The cold liquid paired with a shot of caffeine made the early morning hours a little friendlier. 3) My co-workers who brought cookies. Some people balk at a sugar rush first thing in the morning, but sometimes it’s a good thing. I was not crazy about being at work when I am usually asleep, but being able to eat cookies as soon as I arrived kinda softened the blow. But let me say for the record, Berry Burst Ice Cream Oreos are TERRIBLE. 4) Breakfast. Or in my case, lunch because my day started at 2 AM. When we’re lucky enough to have a catered meal at work it’s usually just from the on-site cafeteria, which isn’t very good, but our breakfast yesterday morning was some seriously delicious quiche. I’m usually not a big fan of quiche, but the slice I had with sausage and ham and cheese was fabulous. 5) More caffeine. Our daily supply of drinks arrived with breakfast and it was well-received. I used a can of Coke to make it through the last few hours of my shift. By mid-morning I was definitely fading fast, but the surge of caffeine and sugar got me to the end of my workday. 6) Leisurely shopping. When I left work at 12:30 PM I just wanted to go home and crash, but I had to get the ingredients for dinner beforehand. As I said yesterday, I went to three stores to get pasta, tomato products, and meat for last night’s spaghetti. It was worth it. And shopping during the day is much more relaxing than in the evening. 8) Not having to get up early. Even though I was exhausted I had a really difficult time going to sleep last night, but luckily I didn’t have to be at work early this morning. So I slept in much later than I usually do on a weekday to make up for it. Too bad it was Tuesday and the garbage trucks started driving up and down the street at 7 AM!